GREENPOINT — Animal rights activists who planned to protest outside a chicken slaughterhouse this weekend canceled their demonstration when they learned the facility closed months ago. 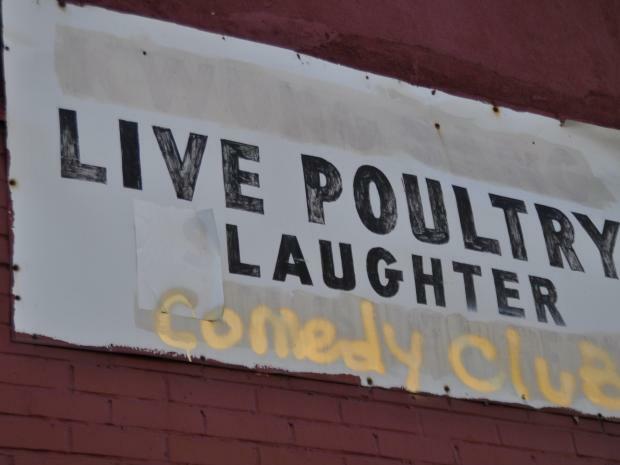 Protesters who had prepared to rally on Saturday outside the location of Lee's Live Poultry — which was defaced with graffiti last fall that read "Live Poultry Laughter Comedy Club" — for Saturday's World Day for Farmed Animals said they had not known the slaughterhouse shuttered this spring. "Last time I was there it was active and recently I've only been there at night, so I had no idea," said Greenpoint resident Shafali Patel, who was coordinating with the national group the Farm Animal Rights Movement and with NY Farm Animal Save. "Since FARM had that location in mind and I was familiar with it, we just decided to use that location since it is in a visible area — or it was," Patel continued. The slaughterhouse with a stench that bothered residents for years "flew the coop" in March, local Councilman Stephen Levin previously said. "We've been getting complaints as long as I've been in office...it was really bad," Levin previously said. "I know people on Milton Street who couldn’t use their backyards because it smelled." Patel said the protest has been relocated to two slaughterhouses in Flushing, Queens.